I’ve always disliked the MityVac hand pump, but it was all we could find at the time. Before that we used a very expensive siphon pump that we sourced from a steam fitter catalog. 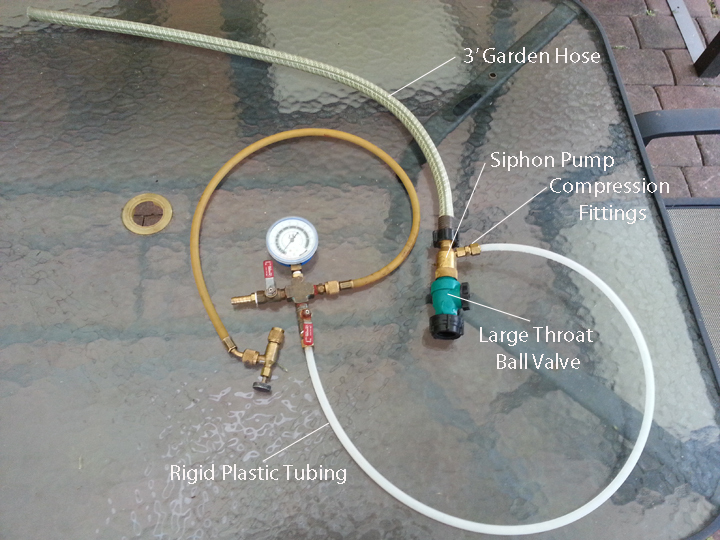 About a year ago, Eldon told me about a garden variety siphon mixer that he had used to evacuate his system. I bought one and have been experimenting with it. I consistently get vacuums at 29″ in just a few minutes using this pump and city water pressure. The Hozon Brass Siphon Mixer is idea for this use if you make a few modifications. 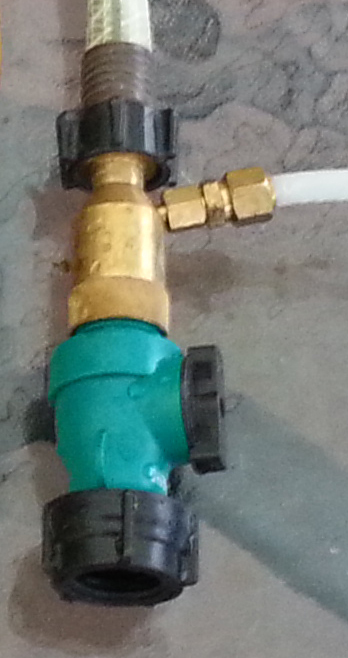 I used compression fittings to attach the rigid plastic hose for an airtight seal. I also used a large throat ball valve to increase flow at siphon. The 3′ of garden hose at the end increases the vacuum by a few inches by not letting air back into the pump. On a tall roof, I used a long garden hose as a secondary siphon to pull the water back down to ground level thereby increasing the relative pressure at the siphon mixer. This is so much easier than the hand pump. Drawing down my empty two Cricket system to 29″HG took only 10 minutes. After filling the system with water to the correct level it took only 1 minute to draw the cold system down to the point that the collectors started pumping. Here’s a closer look at the siphon mixer in my apparatus. The bane of the geyser pump has always been leaks. 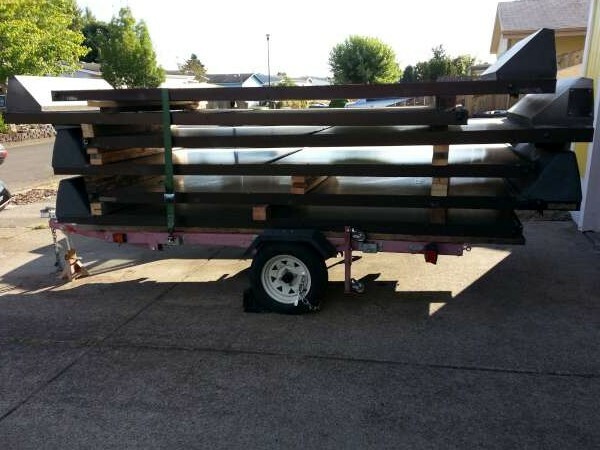 When I met Eldon, he and Don Ladigan were working on a prototype. They had attempted to make the header/riser connections with brass braze on copper and fill in the gaps with solder. It didn’t work. After we learned silver-brazing things got easier, but we still eschewed any possible loss of system integrity. Fast forward 25 years: The system on my home, the first prototype of a double CC system has been failing for several years. I could get it going for a few weeks, but then it would over heat and stop. I checked every fitting several times and even opened up the collectors and tested them. I couldn’t find a leak. Eventually I went for broke. I filled the system with water and let it over heat and over pressure. I stripped off the insulation looking for a coupling that may have been hidden in a straight pipe run, and found some wet insulation. The copper pipe was discolored. But I couldn’t see where the water was coming from. I emptied the system, pressurized it with air, and sprayed soapy water on the pipe. Withing seconds it flowered into a dozen soap bubble mountains. I couldn’t imagine what happened. We believed the methanol solution to be safe from acidification, so I surmised that it must have been the pipe. I removed 30′ of 3/4″ soft copper tubing from my attic. I attached caps to the ends and an air fitting and pressurized the two lengths of pipe. There were pin-hole leaks over the entire length of tube. 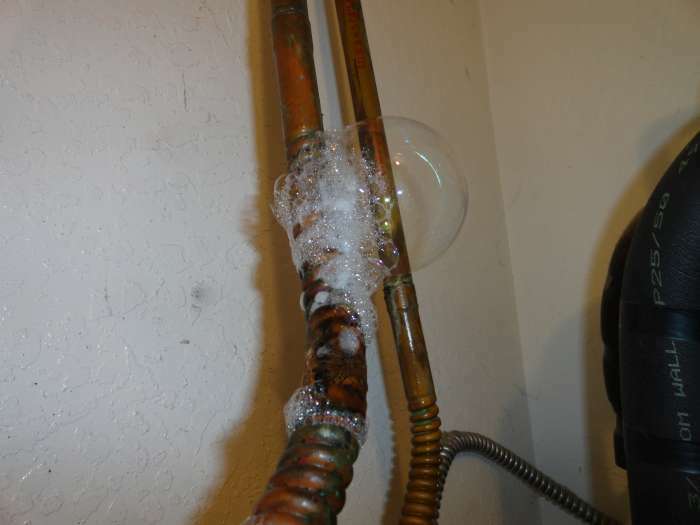 There were no leaks other than in the soft copper tubing, and there were at least 15′ of rigid copper. It must have been the soft tubing. I replaced all of the soft tubing with rigid tubing and elbows. Last Thursday starting at 5AM before the attic heated up. The plumbing went well, and I finished up the 26 solder joints at 8AM. I had a cup of coffee, and then pressurized the system to 120 psi with air. I couldn’t get the pressure to hold, so I looked up at the collectors and noticed that I had left the fill valve in place and open. Doh! I hopped up on the roof and closed the valve. The system then pressurized to 125 and held, but after an hour it had lost about 5psi. I figured that with 26 joints there was a high probability that I has a leak in one. This morning, Saturday, I decided to hunt down the leak. Again starting early, I went into the attic with my flashlight, mirror and soap sprayer. I dowsed every fitting and there were no leaks. I removed all of the insulation remaining on the rigid pipe: no leaks. I went into our laundry room where the tanks reside and tested the new fittings coming through the ceiling: no leaks, but then I heard a fizzle in the insulation below the new fittings. I removed the insulation and found more leaks. 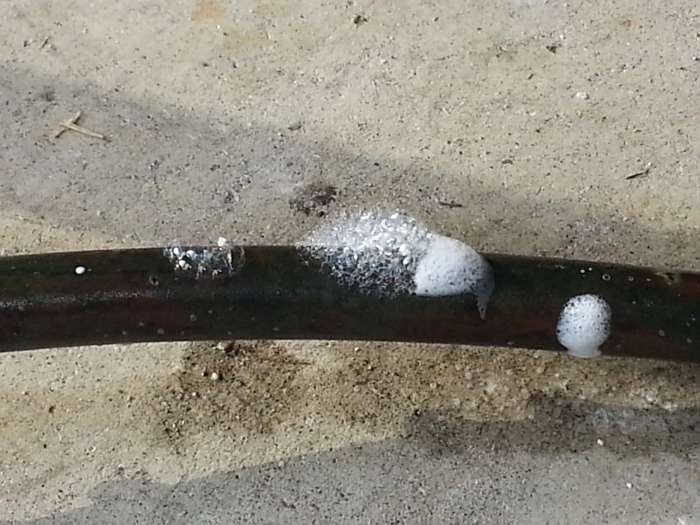 There were bubbles emanating out of the entire 2′ length of the flexible connector. So it wasn’t the soft copper. This is a completely different piece of copper from a different manufacturer. NEW THEORY: The methanol solution turns acidic when it sits for a long time in the presence of air. I had left my system sit for about a year after it blew its fusible plug. I’m sure it blew all of the fluid out of the collectors and a lot from the pipe runs. The soft tubing that failed was almost completely horizontal, so as it evaporated, the air interface probably moved down the length of that pipe. A year later I tried again, and failed but I drained almost all of the fluid from the system. I remember there being more fluid in down near the heat exchanger when I blew air in to pressurize it. I left the fluid in for several months before completely draining the system. I’m guessing that the fluid was up in the flex connector and ate its way through. The other flex connector didn’t show any signs for leaking, so I left it in place. I plan to activate the system again with pure water for a few weeks before filling it with methanol again. That will flush anything out that shouldn’t be there including the flux from the soldering I just completed.